Former communications director for Donald Trump's speaking tour canceled after Twitter survey asking how many Jews died in Holocaust. 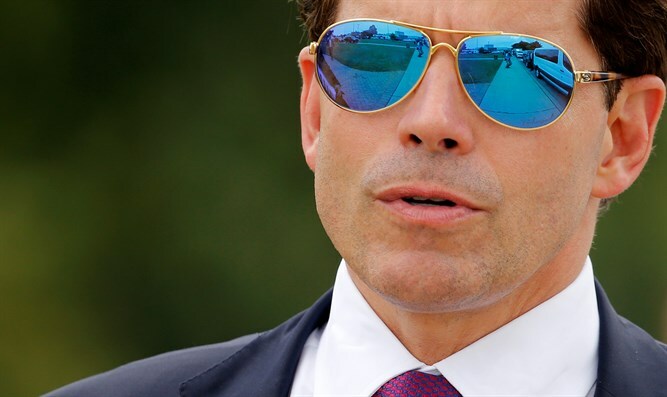 JTA - Anthony Scaramucci, the financier who briefly headed communications for President Donald Trump, reportedly has lost at least one lucrative speaking engagement after a Twitter account in his name posted a survey asking people how many Jews were killed in the Holocaust. On Tuesday, an account associated with Scaramucci posted a tweet asking “How many Jews were killed in the Holocaust?” and offering multiple choices: “Less than one million, between 1-2 million, between 2-3 million, more than 5 million.” The historical figure, 6 million, was not offered. The tweet was up for an hour and was near 5,000 responses before being removed by Lance Laifer, who apologized for it. Scaramucci later said Laifer was his partner. Scaramucci announced Tuesday afternoon on his personal Twitter account that he had pledged $25,000 to the Simon Wiesenthal Center in the wake of the survey.